Religious themed graphic images and web elements, including HTML web templates with a religious theme, stock photos of churches, crosses, and ministries. Great collection for churches, ministries, christians, buddhists, muslims, and jewish faiths. Religious themed graphic images and web elements, including HTML web templates with a religious theme, stock photos of churches, crosses, and ministries. Great collection for churches, ministries, christians, buddhists, muslims, and jewish faiths. 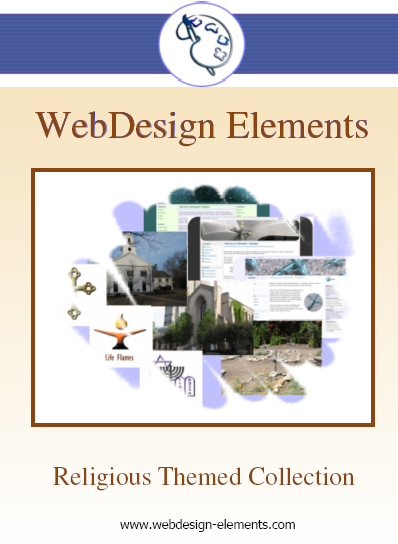 Includes a fantastic collection of all web elements needed to build a website designed specifically for religious organizations and religious faiths. Images are high-quality and available in a variety of formats, purchase the CD for a large collection of stock photos, web templates, layouts and logos all related to religion.